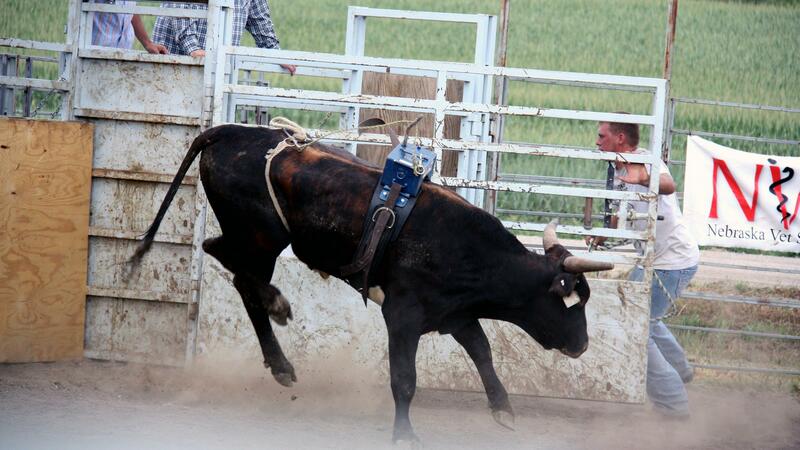 Bulls are judged with a "dummy" weight for four seconds to see how hard they will jump and twist to buck a rider. Bulls that do well can sell for up to $50,000. The bucking bull has long been the embodiment of the American rodeo, and it takes just four seconds for a strong young bull to reap its owner as much as $50,000 in prize money. Four seconds is how long each 1- or 2-year-old bull will wear a weight strapped to its back as the massive animal is judged on how high it kicks and how much it twists. In the past 10 years, bucking bulls have become a major industry. The price of the best bloodlines can soar to $250,000, and competitions take place everywhere from Madison Square Garden to Wyoming. Randy Shippy, owner of Shippy Rodeo Bulls in Colome, S.D., has seven bulls entered in a nearby regional competition. The competition is used to get young bulls ready for the contests with higher prizes. The bulls kick and defy the brawny cowboys trying to place a blue box known as a "dummy" on their backs. By throwing off the box, the bull learns what it's like to throw weight. It's supposed to get him ready to throw off a determined cowboy in a year or two, and Shippy says training bulls this way is only one new thing about the sport. "We're trying to get animals that have good structure, good muscle, lots of kick, speed, intensity, you know, where they're really whipping," Shippy says. Over the past 10 years, prize money has increased tenfold, industry officials say, because of the combination of more sponsors, greater competition and television contracts. "People like coming to bull ridings — businesses know that," says Tony Weborg, the owner of the bull ring hosting the competition. "Bull riding draws good crowds, so they get a lot of bang for their buck." Smaller competitions draw sponsorship from local business, but the national bucking bull competitions attract weightier sponsors: Ford, Stanley Tools and Evan Williams Bourbon. The industry has grown as major networks have signed on to air bucking bull events. Matt Scharping, a Minnesota genetics company executive whose stiff collar looks a bit out of place in the dusty ring, gets publicity from a bull he co-owns with professional football player Jared Allen of the NFL's Minnesota Vikings. The winnings support Allen's charity to help wounded soldiers. "Since March we've raised $33,000 for the charity — the bull industry has," Scharping says. The bucking bull industry has grown by 500 percent, according to the Professional Bucking Bull Association: Entry fees are up, and prizes are 10 times larger than they were 10 years ago. Spectators and investors know they might not win big; in fact, they might lose what they've spent on the sport. But it's the challenge, they say, even the romance of literally rubbing shoulders with an enormous bull — an icon of the rodeo — that inspires them. As the stakes keep growing, more people are getting into the game, in turn making the stakes grow even higher. The Professional Bull Riders Association says its world championships in Las Vegas this fall will pay the top winners $2 million. Copyright 2012 KCUR-FM. To see more, visit http://www.kcur.org/. Now to a bullish market. And we're not talking Wall Street but the rodeo. The bucking bull has long been the embodiment of the American rodeo: brute animal strength in a contest with a cowboy clinging desperately to a bull's back. In the last 10 years, bucking bulls have become a major industry, with the price of the best bloodlines soaring to a quarter of a million dollars and competitions from Madison Square Garden to Wyoming. MONTAGNE: As Laura Ziegler reports from member station KCUR, this business is attracting some of the money and prestige once reserved for horse racing. She found that out by going to a competition in Nebraska. LAURA ZIEGLER, BYLINE: It takes just four seconds for a strong young bull to reap its owner as much as $50,000 in prize money. ZIEGLER: Four seconds is how long each one and two-year-old bull will wear a weight strapped to their back. Each one of the massive animals will be judged on how high they kick, and how much the twist. RANDY SHIPPY: You know, we're trying to breed our bulls to be a more athletic build. ZIEGLER: Randy Shippy is a slight man in an orange T-shirt that says House of Jesus. He owns Shippy Rodeo Bulls in Colome, South Dakota. He's got seven bulls in this regional competition. He used to get young bulls ready for the contests with higher prizes. ZIEGLER: A massive two-year-old bull thrusts his back legs in a killer kick against the metal walls of the chute, defying four brawny cowboys trying to place a blue box known as a dummy on his back. By throwing off the box, the bull is learning what it's like to throw weight from his back. It's supposed to get him ready to throw off a determined cowboy in a year or two. Shippy says training bulls this way is only one new thing about the sport. SHIPPY: We're trying to, you know, get animals that have good structure, good muscle, lots of kick, speed, intensity, you know, where they're really whipping. And so, I mean they were things that we look for. UNIDENTIFIED MAN #1: This next bull out is going to be 10-0-8, Pork Chop from Rehny Dibett. ZIEGLER: Over the last 10 years, prize money in the bucking bull business has increased tenfold, industry officials say, because of the combination of more sponsors, greater competition, and television contracts. Tony Weborg owns this bull pen and ring. TONY WEBORG: People like coming to bull ridings. You know, businesses know that, you know? Bull ridings, they draw good crowds. So you know, they get a lot of bang for their buck. UNIDENTIFIED MAN #3: Whoo, whoo, whoo! ZIEGLER: The national bucking bull competitions, of course, attract weightier sponsors: Ford, Stanley Tools, Evan Williams Bourbon. UNIDENTIFIED MAN #5: They're going to want to have a meeting, without a doubt. ZIEGLER: The industry has also grown as major networks sign on to air bucking bull events. Matt Scharping, a Minnesota genetics company executive whose stiff collar looks a bit out of place in the dusty ring, gets publicity from a bull he co-owns with All-Pro defensive end Jared Allen. The winnings support Allen's charity to help wounded soldiers. MATT SCHARPING: I went to him and I said, you know, I think this could be a great fit for you, you know, then we could, you know, raise some money for the charity, and that's what we've done. Since March we've raised $33,000, the bull industry has. UNIDENTIFIED WOMAN: Open her up, boys. ZIEGLER: The bucking bull industry has grown by 500 percent, according to the Professional Bucking Bull Association. Spectators and investors here in Pender, Nebraska know they might not win big. In fact, they might lose what they've spent on the sport. But it's the challenge, they say, even the romance of literally rubbing shoulders with an enormous bull, an icon of the rodeo, that inspires them. IVAN STOLFUS: My other business bankrolled some of this hobby I have in bucking bulls. ZIEGLER: Has it paid off? STOLFUS: Probably not. I mean, what I've invested, my money over the years - yeah, I haven't gotten all my money back yet. ZIEGLER: Ivan Stolfus knows this is an expensive, high risk hobby. But as the stakes keep growing, more people like him are getting into the game, in turn making the stakes grow even higher. For example, the Professional Bull Riders Association says its world championship in Las Vegas this fall will pay its top winners $2 million. For NPR News, I'm Laura Ziegler. UNIDENTIFIED MAN #6: I need them two-year-olds first. UNIDENTIFIED MAN #7: (Singing) I went through the land of milk and honey. At the end of the day there's always more milk than money. Transcript provided by NPR, Copyright National Public Radio.